“…The call to pastor is a calling that God puts on your heart. We’ve raised up three really great, strong churches where, not only the lost were saved, but discipleship happens and communities form. On the music side, the music is just in us. It’s what we’ve always loved since we were just kids. To have a national and an international stage is beyond our wildest dreams. 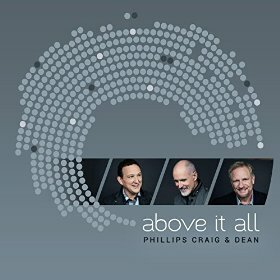 That part of it is still so empowering…” With more than two decades of music ministry behind them, vocal trio Phillips, Craig And Dean (consisting of pastors Randy Phillips, Shawn Craig and Dan Dean- each a pastor at three different churches in America) released their new album Above It All this week. Known for their powerful and compelling worship ballads, and their cover songs that never fail to astound and amaze me time and time again (inclusive of their mega radio singles “Revelation Song” and “When The Stars Burn Down (Blessing And Honour)”), this album is no different to their many, many successful and popular albums released previously. Veterans in the worship music industry, Phillips, Craig And Dean have created a stellar and engaging album, as Above It All combines the energetic and enthusiastic heart for Jesus that each of the three vocalists have, a fresh and relevant musical sound, as well as the musical prowess of producer Seth Mosley. If you’re not a fan of the PCD guys, then there’s no album like this one to start listening! The lead single “Jesus Only Jesus”, a mid-tempo ballad, forms the backbone of the album thematically. Originally written by Matt Redman, the song features Randy, Shawn and Dan singing together in harmony. We are treated to a 4 minute tune of unbridled and unashamed worship, with a backdrop of captivating keys and brilliantly played synth, where we can declare that Jesus is worthy of our praise and that He is the One who we can call on at all times. In fact, the chorus where the trio passionately cry out ‘…holy, King almighty Lord, saints and angels all adore, I join with them and bow before, Jesus, only Jesus…’, is the most spine tingling, God-breathed encouraging part of the song, as we are reminded that Jesus is our everything, and this song is perfect as the choice for the lead single of the album, as the theme of the album is giving honour and praise to Jesus, and lifting Him up because He is. “Let It Be Known”, written by Tim Hughes, is the other cover on this album, and to me is almost a carbon copy of Lincoln Brewster’s version, though the track is very catchy and danceable. Filled with lyrical clichés and cheesy music, there’s still something about the tracks that get me dancing and moving my feet. Not Tim’s best work by a long shot (leave it to songs like “Here I Am To Worship”, “Happy Day” and “At Your Name” to inspire), the electronic synth, pulsating beats, and a modern pop dance sound breathes new life into this formerly lackluster offering. The chorus is especially inspiring, with the simple words of ‘…Let it be known, that our God saves, our God reigns, we lift You up, up, up…’, moving me to lift God’s name on high and worship Him with all I am. Throughout the rest of the album, Randy, Dan and Shawn all sing out fervent, emotional, honest and personal melodies that are fit for either corporate or personal worship, and can be sung on any Sunday set list and still be enjoyable! “What Hope Feels Like”, the album opener, is musically what we’ve come to expect from the pop/CCM/gospel trio. The song dives right in musically and thematically, as we are met with a song vividly describing how hope feels like. Against the backdrop of vibrant vocal layers, pulsating electronic effects and emphatic electric guitar, we hear the group declare that ‘…I’m learning to live again, I’m learning to hope again, I’m not going back again, because I’ve been born again…I’m saying hello to life, this is what hope feels like…’, and we are gently reminded that Jesus is our hope, and the only One we can lean on and trust! Similarly, the emphatic title track is ‘tried and true’ Phillips, Craig, & Dean, with the melody anchored by commanding and eclectic vocals, as well as big booming synth and rousing guitars. Shawn reminds us that “…No matter what circumstances we are walking through, there is a God who is unsurprised by what we’re facing. Everything around us is topsy-turvy…but this song encourages believers to look up as Isaiah did. That’s really the principle here. The Lord is high above it all. It’s a great message that we need to be reminded of…”, and this song gives us new perspective and is a gentle reminder that the trials we face can be moulded and shaped by God so that we can develop our character- in every situation something good can come out of it, and that is a brilliant concept and hope to hold onto! Another stirring and powerful worship ballad is “Throne Of Praise”, which starts off as a soft piano led piece and later swells to an epic orchestral movement of gigantic proportions, driven by keys, guitar and a slew of other instruments as well! Though a tad little CCM musically, we are treated to strong lyrics, as we singing about how we are to devote out lives wholeheartedly to God, and praise Him greatly for all the things He’s done for us, building a throne of praise, and singing from the top of the rooftops His glory and sovereignty. What an explosive and majestic anthem to remind us all of God’s goodness by! “Hope Has A Name” is led by the acoustic guitar, and is an upbeat joyous and celebratory track that sounds like a folk tune, something that Rend Collective would record. Full of life and cheerfulness, the track speaks out the eternal truth that ‘…our hope, our hope has a name, Jesus, Jesus is with us…’– though the lyrics are simple, the presence of the banjo and the enthusiasm of all three vocalists add depth and character to a song that could have easily felt stale or ‘done before’- instead the song is fresh and reinvigorating! A track that almost brings tears to my eyes, is the emotional acoustic guitar ballad “Voices From The Other Side”, inspired by the passing away of Dan Dean’s father recently. Reminding us of the good times and enjoyable moments that we all have with our family, this expressive, honest and encouraging melody shows us that we need to cherish our family because we don’t know what’s coming tomorrow. But even still, we should be happy if our loved ones know and believe in Jesus, and this song gently shows us that our loved ones are smiling down from heaven to us, and this song definitely brings comfort, especially to me. Almost mistaking “Come As You Are” with Pocket Full Of Rocks’ poignant and explosive worship ballad, PCD deliver a high quality track as well, with this heartfelt piano led ballad highlighting that we can ‘…come as you are…with your heart wide open and broken…with your wounds and scars, He is waiting, hear Him saying fall into My arms, come as You are…’, as the instruments start of quietly, then build to an epic guitar led majestic finish! Similarly, the album ender “Join The Song” also speaks about coming to God with an open heart and our everything, as this electronic and remix-y dance anthem directs us as a prayer for us to join the ‘…song of the rescue and redeemed, the song of the ones who’s been set free, Hallelujah chains are gone, join the song…the song that’s rising up within, hope is returning once again, hallelujah chains are gone, join the song, join the song…’. Led by eloquent and impressive electric guitar work, we are once again given a treat that I can listen to and enjoy again and again. But the song that is the pinnacle lyrically in the album, is the melody “If Not For Grace”. Buoyant and brimming with optimism and happiness, the trio sing their harmonies and melodies to perfection, and is a track written by Dan Dean, his son, and Jennie Lee Riddle; about the theme of grace and how it lavishly invades our lives, and makes us whole with Christ because of His work on the cross. Summing up what the gospel is all about, we are met with a simple song musically, with drums, keys and guitar making the track a powerful worship ballad turned anthem, but vocally and lyrically packing a punch, that has me bobbing my head and lifting my hands to the heavens as I praise God! “…It’s so incredible when churches sing our songs, when people write us and tell us that they were going through a particular thing in their life, they heard one of our songs and it changed them. It’s just something you don’t get over and it keeps it fresh…” while I haven’t fully listened that much to a Phillips, Craig And Dean album from start to finish before, Above It All has changed that opinion greatly, as I appreciate this vocal trio more, and am ministered to by their music! These guys have been recording music for a while, and they don’t seem to be slowing down, which is great! There’s plenty of musical styles on this album, and I encourage you all to listen to these 10 songs of joy, praise to God, and adoration. Worship music at it’s finest, this is one of the best worship albums of 2014, so dive in, and enjoy! You’ll especially love this album if you like artists like Newsong, Big Daddy Weave and Jason Crabb!